When the dwarves loaded up their Earthships and abandoned the city above, they intended to take all the clans that lived here with them. But in the months leading up to their departure there were disappearances from the city. Religious fanatics, young idealists, and some struck by pure greed from their time in the mines were among those who went missing. These self-exiled dwarves hid themselves away in the deep mines where they built a small outpost to live in. In the years right after the departure from the city, they went back to the sprawling empty halls, but eventually returned here where they were less haunted by the echoing empty halls of their decisions, and where they had a small enough settlement to be able to defend properly with their restricted numbers. For that is what they do now – they defend. Their settlement is besieged by thin and loathsome humanoids with pitch black skin and not a hair on them. Foul rubbery and cold-blooded things that haunt the darkness and are invisible to infravision / darkvision, requiring lamps and torches to be kept lit to find them. They have formed some sort of nest or hive just south of the dwarven settlement, but the dwarves lack the manpower to clear it out. At least the exiles have food. The mud that slides down here from the mushroom cave far above is rich with fungus, and a unique breed of mushroom grows in the depths – the black cap mushrooms that provide all the nutrients needed by the dwarves and also tastes like a rich and sweet chocolate steak. But it is these magically psychotropic “Black Cap” mushrooms that have given the Dwarven nightmares flesh and form. In the dark unwatched areas, the stalkers crawl out from under the caps of the mushrooms. They are everything the dwarves fear – they cannot be seen, they never speak (and seem to communicate with each other telepathically), they care nothing for gold or ale, but instead crave the flesh of dwarves. They stalk the tunnels and threaten to overrun the small encampment that subconsciously brought them into being. And who knows what forms the mushrooms will bring forth once the adventurers have been here? The exit to the left of the map leads to the Hematite Mines (and the northern of the two eastern exits from that map node). 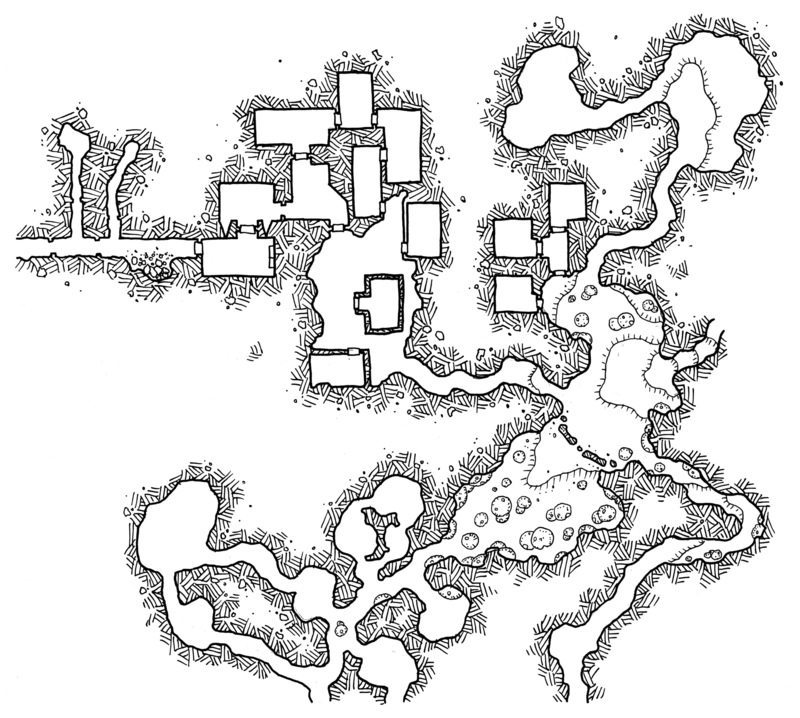 The three exits at the bottom of the map lead south to the Giant Citadel. And the passage to the right leads up sharply through mud and twists and turns to the sinkhole at the bottom of the area under the mushroom cavern. 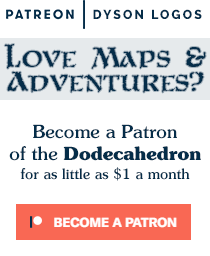 There’s also big news today about the Dodecahedron Patreon campaign. As of last night we have crossed the $300 funding mark. This means that every map that gets $300 of funding will be released under a full free commercial license. The full announcement will be posted tomorrow regarding how I’ll be keeping everyone up to date on the funding levels and which maps will be released under this license. What it does mean for now is that the first map released next month will be released under this new license. Which means I’m going to try to pull out all the stops and produce something impressive for this one (which will also be the first map that isn’t part of the Mega Delve in quite a while). Oops, one of my fantasy maps that I asked for is already done! The whole lost river series is a goldmine for the current point in my campaign. How serendipitous.